During the 2001 excavations archaeologists found the remains of the bakery/brewhouse built by the first settlers in 1622. 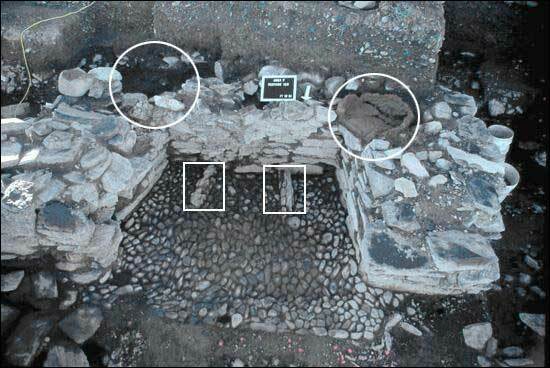 The image below shows the fireplace from this structure. Visible in each corner are the remains of large North Devon ceramic ovens in which bread was baked. 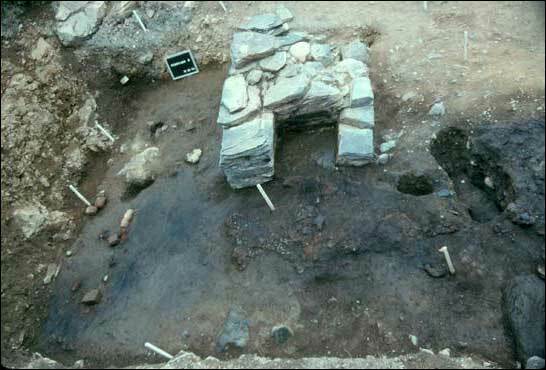 The two vertical slabs in the hearth supported the "brewing copper," a large cauldron in which the ingredients for beer were boiled before fermentation took place. Shown belowe is the lower portion of a wood-lined well that was probably incorporated within the bakery/brewhouse. The upper portion was lined with a cribwork of logs and the lower portion with a double layer of horizontal and vertical boards. The well was remarkably devoid of refuse, suggesting that it might have been enclosed and water removed by means of a pump. A scarp and a counterscarp are the inner and outer sides of a ditch or moat used in fortifications. 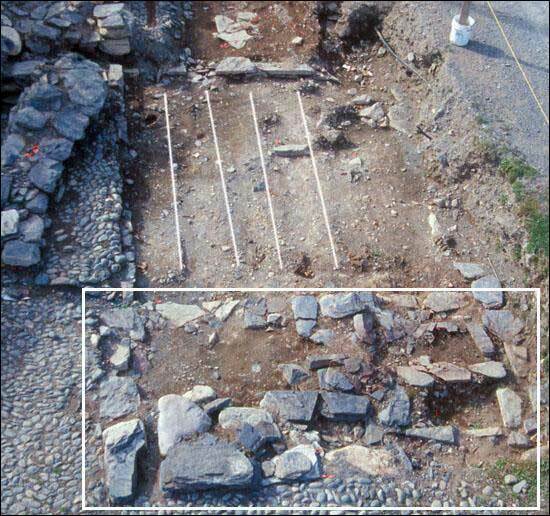 The complete excavation of a structure incorporating a large stone chimney revealed the remains of a building measuring 12' by 14', exclusive of the chimney. The dimensions match exactly those of a "parlour" built by the first settlers in 1622. 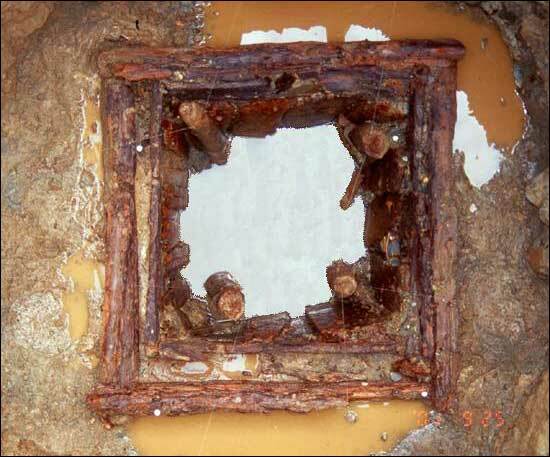 Below can be seen the remains of the fireplace and the remains of floor joists that supported a wooden floor. In August 1622, Captain Wynne wrote to George Calvert that, "the forge hath been finished these five weeks." 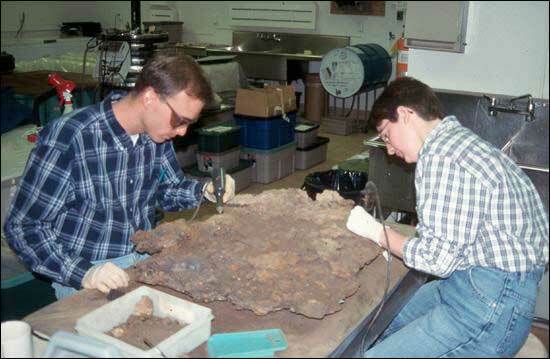 During the mid-1980s and again a decade later the forge was completely excavated. Shown below is the stone forge where iron was heated. The small alcove held the slack tub where hot iron was quenched. The large hole to the right of the forge held the anvil stump. The forge floor, blackened by slag, scale, coal and charcoal, shows clearly. 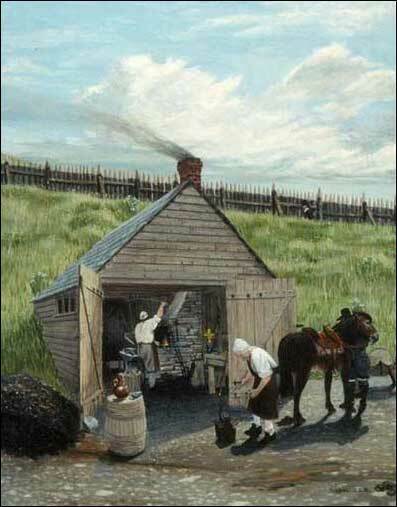 The painting below by David Webber shows the forge as it might have looked about 1625. It was dug into the bank to the south, sided with boards and roofed with slate. The smith in the foreground is shoeing an Exmoor horse, probably the ancestor of today's Newfoundland pony. A painting of the Colony of Avalon's forge by David Webber. Among the tools found in the forge were a smith's hand vise (1st image below), used to hold small objects that were being shaped, and a shears used to cut hot metal. 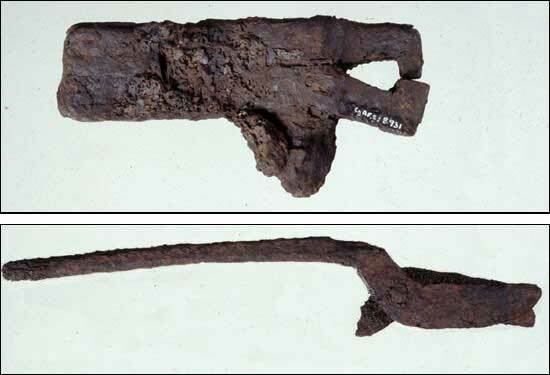 The shorter arm on the shears was meant to fit into a hole in the anvil so it could be operated with one hand. The large lumps of scale that flanked the anvil were removed and taken to St. John's to be carefully dismantled under controlled conditions. Three iron axes, ceramics, glass, iron tool fragments and scrap iron were recovered. 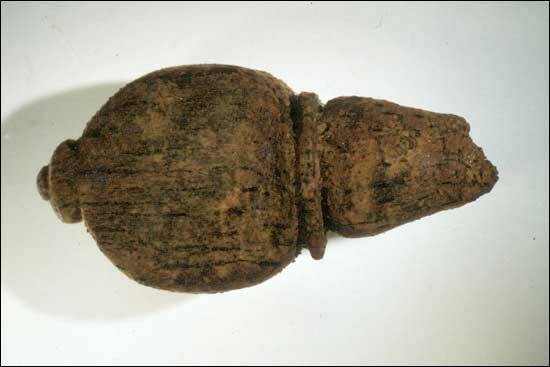 An unusual find from the slag was a wooden tuning peg from a small stringed instrument. 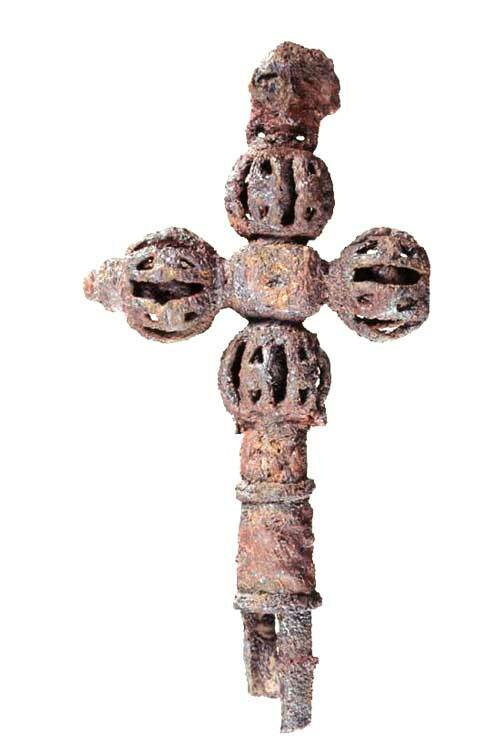 One of the most interesting artifacts from the forge is an elaborate iron cross. The interior of the socket, meant to be mounted on a staff, and the interiors of the orbs are of brass. Traces of the original gilding can be seen near the center of the cross. It is not certain whether it is of Roman Catholic or Anglican origin. If it is the former, it brings to mind Calvert's wish to maintain Avalon as a religiously-tolerant colony, the first in British North America.